From an architectural view point, Biosphère, musée de l’environnement is very pretty, even if my photos don’t really pay justice. 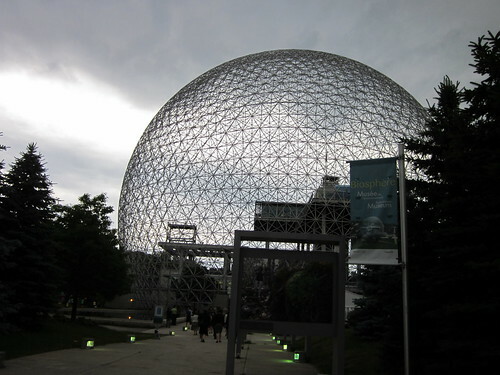 I first visited Biosphere (after years, and I can almost say decades) of wanting to visit this past summer when I went to a meeting of the Commission for Environmental Cooperation of North America (one of my academic research meetings of 2011). Architectural masterpiece and symbol of Expo 67, the Biosphere is a unique and spectacular structure, located at Parc Jean-Drapeau in Montréal. Treat yourself to its interactive exhibitions aimed at increasing understanding of major environmental issues. Participate in its animated activities and special events throughout the year to learn more about day-to-day solutions to protect the environment. I found Biosphere fascinating, mostly because it felt like a childhood dream realized in my adulthood. More importantly, I found out that this wonderful museum has both permanent and rotating exhibitions. The Biosphère distinguishes itself by its interactive and educational exhibitions which are aimed at increasing understanding of major environmental issues such as air, water, biodiversity, climate change, sustainable development and more. Visit our permanent and temporary exhibitions to discover new ways to reduce your ecological footprint! 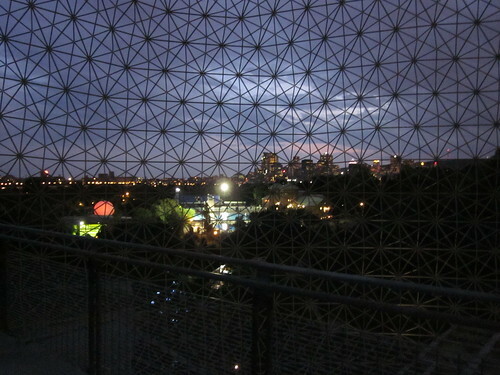 Have you ever had the opportunity to visit Biosphere Montreal? If so, how did you like it? I went once because someone I knew had a class who was participating in some school fish sculpture exhibit. Anyway. This thing has always been part of the landscape–even before it was the Biosphere. It’s one of the rare buildings from the Expo that still stands. It’s also not as popular as the Biodôme.